It’s that time again. I’ll be firing my kiln in March. As soon as I can I’ll post new images of work from this year’s firing. It has been a busy spring preparing for the firing. I moved into a new studio in January with Ryan McKerley. Have a look at his work! There are lots of new images to look at on the site so please visit the Works section. I have a new article posted at Cablegram. Eric Zimmerman, the host of the site, has put out a call for articles on the ever widening discussion of art. This is my contribution. I recently added two new galleries in the Work section of the site. These galleries contain a selection of pots from the Spring firing. It was a good firing with more strong work than I am accustomed to having from the kiln. The timing was good as this summer looks to be the hottest on record and that makes for uncomfortable times in the studio. Several shows are coming this fall (a few can be found listed in the column to the right). I’ll add additional information as details emerge. As always if you have any questions about the work or the content found on my site please use the Contact link to email me. This piece will be on display at the Austin City Hall for the 2009 year. 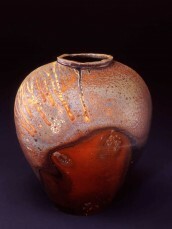 This pot is part of an annual juried art exhibit featuring artist from Austin. If you are in the city stop by and have a look. While you are there have a look at the Jade Walker and Robert Boland pieces. Hello and welcome! The site has been a long time in the making but it is finally here and I am really pleased with it. You will be able to find information on current and future events that I am involved in. You will also find images of my work, both current and older. I plan to update the images after every firing so please check back in often. A big thanks to Ryan Fitzer at Portfoliorodeo.com for designing and building this site. Get in touch with Ryan if you need a new site.